Seagrasses are known to provide important habitats for a diversity of fish and fisheries species. Continued research has allowed us to re-evaluate the generalisations, and identify the gaps in our knowledge regarding these habitats, particularly in an Australian context. Seagrasses generally form part of a mosaic with other habitats within a seascape that contributes to its overall biodiversity of fish. Patterns of abundance and diversity of fish between seagrass and other habitats, such as unvegetated flats and reef habitats, is inconsistent and depends on the region, fish and seagrass species, and sampling method. Edge effects, adjacent habitats, and fragmentation can strongly influence fish assemblages. Seagrass structural complexity can enhance survival and growth of juvenile fishes, but recent studies show that survival rates of individual prey do not vary greatly across seagrass densities when densities of both prey and predators increase with seagrass density. The concept of the nursery habitat has been built on data from studies in estuaries or highly seasonal seagrass habitats, whereas recent studies in marine systems or cool temperate seagrass meadows suggest that this role does not always hold. 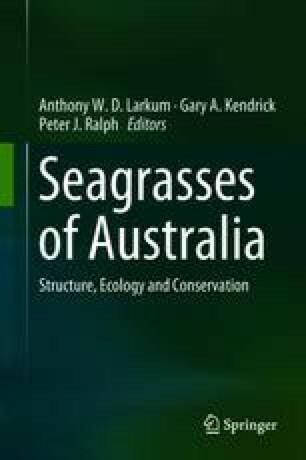 Direct grazing on seagrasses by fishes occurs mainly in tropical regions, although there is a paucity of data on this process along with several other processes, from tropical Australia. Grazing on seagrasses by fishes appears to be limited in temperate regions, with consumption of seagrass restricted mainly to omnivorous species. However, tropicalisation, that is, the immigration of tropical grazers to higher latitudes due to global ocean warming, is predicted to increase grazing rates on temperate seagrasses. Reductions in seagrass biomass caused by increased grazing will disrupt connectivity processes between seagrass meadows and surrounding habitats, and are likely to have significant ramifications for the biodiversity and ecosystem services those other coastal habitats provide. Although other habitats rely on inputs of seagrass detritus, and the immigration of fish and fisheries species from their juvenile seagrass habitats, quantitative data on this link are limited. Evidence that fisheries declines, either directly or indirectly, have resulted from seagrass loss is equivocal to date, and therefore, the quantification of this role is still needed. Managing seagrass for fisheries is complex, and many fisheries agencies embrace ecosystem-based management, but do not have direct responsibility for seagrass habitat. Significant progress has been made in our knowledge of fish and fisheries in seagrasses, but our review highlights significant knowledge gaps where further research is recommended. We thank Paul Lavery and Mathew Vanderklift for their comments on earlier versions of this chapter, and Rob Cole for his comments on a later version. We also thank Lorraine Wyse for her help with compiling the literature, production of Fig. 18.1 and formatting of references.